This Late July Classic Rich Cracker is an all time favourite classic saltine which is flaky and buttery tasting and made using only the best organic ingredients. Ingredients: Organic wheat flour, organic evaporated cane juice, organic oleic safflower oil and/or oleic sunflower oil, organic palm oil, sea salt, leavening (baking soda, cream of tartar), soy lecithin (an emulsifier). Allergens: Contains wheat and soy. Made in a plant that processes milk, eggs, peanuts, and tree nuts. These crackers are so tasty, and a great organic alternative to the less healthy â€˜originalâ€™ cracker most of us grew up with. A great snack on its own, or as an accompaniment to a soup or salad. I try to keep some stocked in my pantry at all times. These crackers taste great. I like that they are organic. I buy them when they are on sale. These are my 4yo's favourite crackers. I like them too. They are like an organic version of Ritz, and taste just as good, if not better. My son is nearly two years old and loves loves these crackers! My son really likes these. I like that they are organic. I loved ritz crackers as a kid but only eat organic food as an adult. These were reminiscent of Ritz. They were yummy. Toddler approved too! Better than Ritz and organic. Amazing crunch, and delish! My toddler loves them! Taste like Ritz, but those are organic, According to me and my family they are very good. Amazing. The perfect organic replacement for Ritz crackers. I'd even dare to say they are better! A treat,and Im so proud to show the lovely box,out for everyone to see. These are the best tasting option I have found in organic crackers. My kids snack on Late July crackers daily. We love all of them. This is a wonderful product that we wouldn't do without. They are perfect! As others have said already, these taste like Ritz crackers but are way better for you. Delicious! 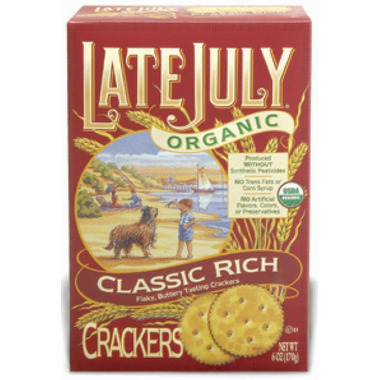 Late July Organic Classic Rich Crackers are a perfect organic replacement for the Ritz cracker I grew up loving. Texture and taste are perfect, and don't leave you with that greasy hands like the Ritz from my childhood. I'm happy to make the switch over to these, even though they are a bit more expensive than the big brand. Basically an organic Ritz. Love them! Love these crackers! Very yummy & the price is right! Will buy these over ritz any day! Amazing! My toddler and I love these. Excellent taste. Will definitely buy these crackers again and again!!! Great taste.........and healthy! Wonderful combination. My kids favorite! Ritz were mine as a kid- and there is no way in any way that I would feed them Ritz crackers- so happy there are these because they are just as satisfying- even better because it is way healthier. an organic alternative to Ritz crackers that tastes way better and is much better for your health!! these are a staple in our house, and my toddler daughter gobbles them up. perfect! Great product! This has become staple in my pantry! Can't even begin to tell you how much I LOVE and appreciate you selling Late July crackers, I've had to avoid most crackers because of the VERY bad oils used to make most store brands, especially transfats, such a canola oil and most people believe the hype that canola is good for us, when it's the only unprocessed oil that is a transfat right out of the plant, then again NO MSG and when sensitive to this poison you learn fast to avoid it. THANK YOU Well.ca and only complaint is that I did a search to get to Late July product page ---- three times and could not get it to come up????? Found it only when you sent me a link to write a review. I bought this product as a snack for my 11-month old. She loves it. It is not marketed as a baby product but the ingredients are just as natural! I eat it too. It tastes buttery. The size and texture is perfect for my baby. I can't seem to find this in other stores. When I first got these crackers as part of a gift basket from a friend, I thought they wouldn't be as good as "Ritz" crackers. I have no idea why I thought natural organic couldn't taste amazing. Was I wrong! These are now my favourites!!! With a side by side comparison, they feel and taste much better than "Ritz". Doesn't matter if "Ritz" are on sale, these are more than worth it for the taste and the fact that they are a much healthier alternative. 5 Stars!!! !